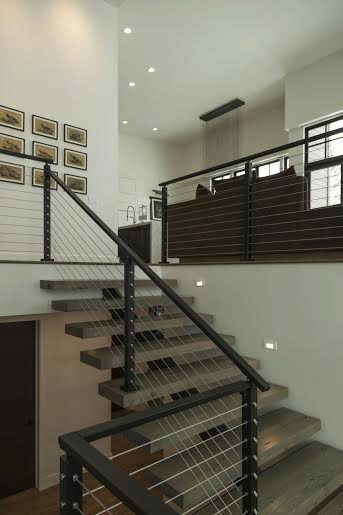 Because of its modern appearance, cable railing is especially beautiful when used with Floating Stairs. In these photos, you can see that the Thick Treads, the Floating Stairs, and the Cable Railing all work together to create a beautiful, contemporary staircase. In addition, the cable railing is able to make a seamless transition from the stairs to the landing thanks to a Post Side Handrail Bracket. This bracket allows the handrail to dive into the post that is on the landing. This smooth transition contributes to the overall clean feeling that the stairs and cable railing provide to the home. StairSuppliesTM is proud to offer both Cable Railing and Floating Stairs to our customers. Feel free to browse our selection to see what systems work best for your application. We’d love to help you achieve your design goals.